The Nature’s Air Sponge comes in 3 sizes: ½ lb, 1lb and 4lb. Each are ideal for the home, office, or car. 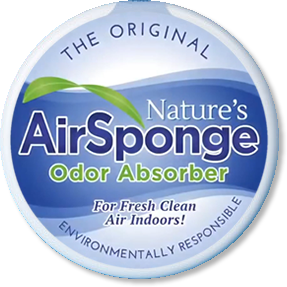 Nature’s Air Sponge is easy to use, simply remove the sticker from the cover and place the Nature’s Air Sponge anywhere you wish to effectively eliminate odors. The ½ lb container works well for spaces for up to 300 square feet (with an 8 foot standard ceiling) and lasts between four and six weeks. The 1lb container is ideal for up to 300 square feet (with an 8 foot standard ceiling) and lasts up to 3 months. The 4lb container is perfect for up to 2,400 square feet and lasts 4-6 months. It can also be placed on the return side of an air handling unit to continuously deliver odor elimination. 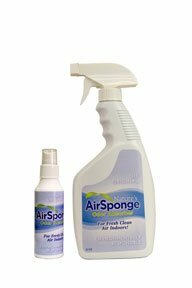 Nature’s Air Sponge also comes in an Instant Spray – a convenient 4oz travel size for eliminating odors on-the-go, as well as a 22oz trigger spray which makes it easy to target odor.